Friends of the Library raising funds for children’s room - Times Publishing Newspapers, Inc.
At the Free Library of New Hope and Solebury, what do “An Evening with Ulysses S. Grant,” the wheelchair lift, and computers have in common? All were sponsored or donated by the Friends of the Library, a group of volunteers organized as an independent non-profit to support the library. Through fundraisers over the past several years, the Friends have contributed over $60,000 to pay for many of the library’s adult programs, computer upgrades, and physical enhancements – the wheelchair lift, rolling book shelves and more. Such items are on a “wish list” by Library Director Connie Hillman and are items the library’s regular budget cannot cover. The Friends’ next major goal is to raise $11,000 to help fund new shelving in the library’s children room, augmenting a generous donation for this purpose from the Charles and Doro Kerr Foundation. The children’s department shelving was not included in the recent renovation and have not been updated in almost 40 years. One regular fundraiser can be seen as soon as you enter the library – a monthly raffle basket. These contain donations from local businesses and organizations. A recent example was a donation from the New Hope Eagle Fire Company. This featured a ride on a rescue boat or fire engine, a fireman’s hat, and logo tee shirts. Other baskets have included garden-related items; theater tickets, restaurant gift certificates, and more. Other Friends’ fundraisers have been author events, a square dance, book sales, and a tour of the American Museum of the Revolution. Two upcoming fundraisers are a private tour of Paxson Hill Farm’s main house and gardens on May 25th, and a Country Blast on November 2nd at Havana in New Hope. Watch for details to come. To learn more, to become a Friends of the Library member, or to donate visit http://friendsflnhs.org. For questions or to volunteer to help, contact friends.nhslibrary@gmail.com. 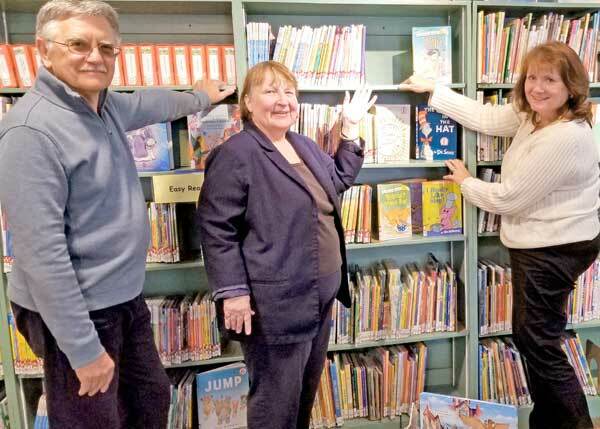 PHOTO CAP: Karl Varnai, from the Friends of the Library organization, discusses the need for new shelving in the children’s room of the Free Library of New Hope and Solebury with Children’s Room Librarian Patricia Lynch and Library Director Connie Hillman.